at customer Bos Shelf in Azerbaijan. 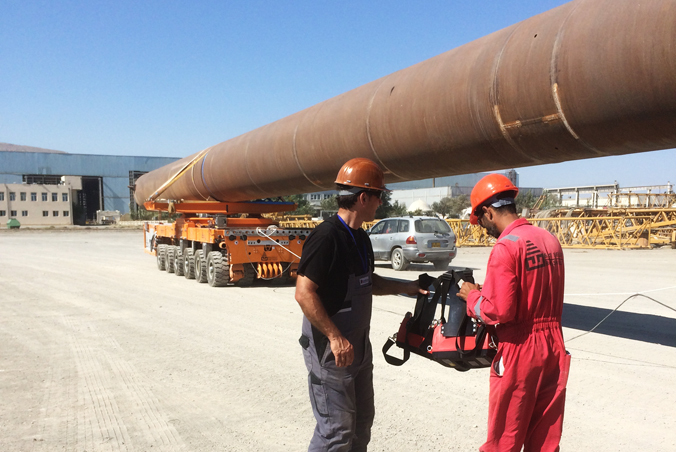 When transporting pipes up to 150 meters in length, the K24's rotary platform is particularly suitable with payloads of up to 600 tonnes. The drive unit is a PPU (Power Pack Unit), which provides the necessary oil pressure for the hydraulic motors. Standard PPUs for the KAMAG K24 are the Midi series with 150kW and the Maxi series with 290 to 390 kW. In the construction of oil rigs, the vehicles are also used for transporting various loads, for example, for large water tanks with a weight of 1,000 tons.